Dalston-based practice Gort Scott has completed a characterful veterinary practice for cats in Bermondsey, London. 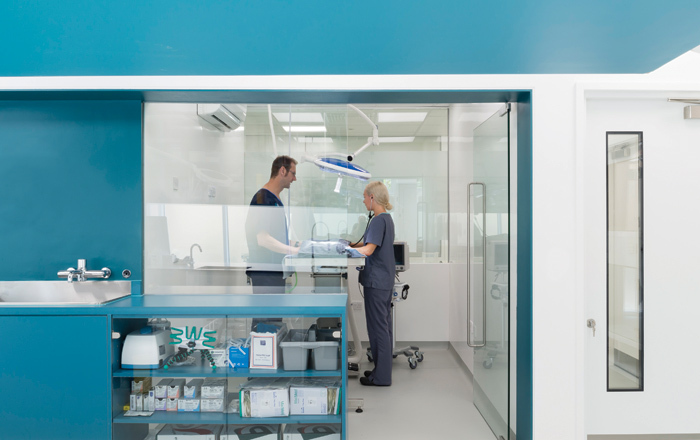 Offering a wide range of facilities, including a full operating theatre and lab, as well as a range of diagnostic imaging methods is The London Cat Clinic. 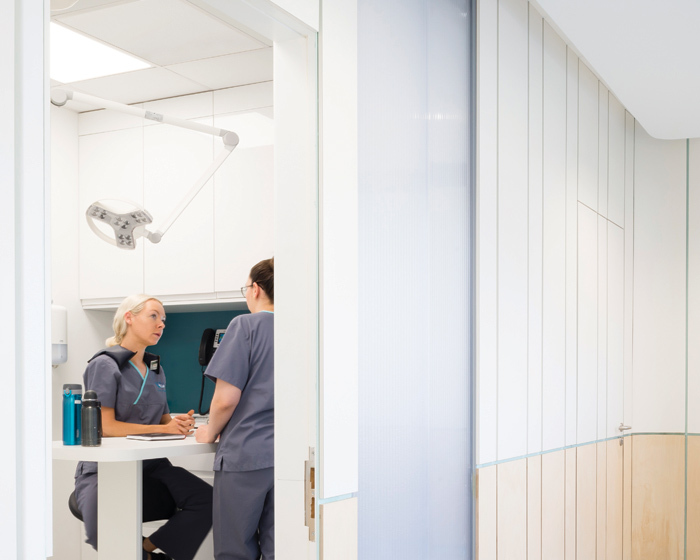 The resulting scheme has a clean, contemporary aesthetic to reflect the client’s cutting-edge approach to veterinary medicine, while careful space planning has maximised the potential of the modestly sized unit. 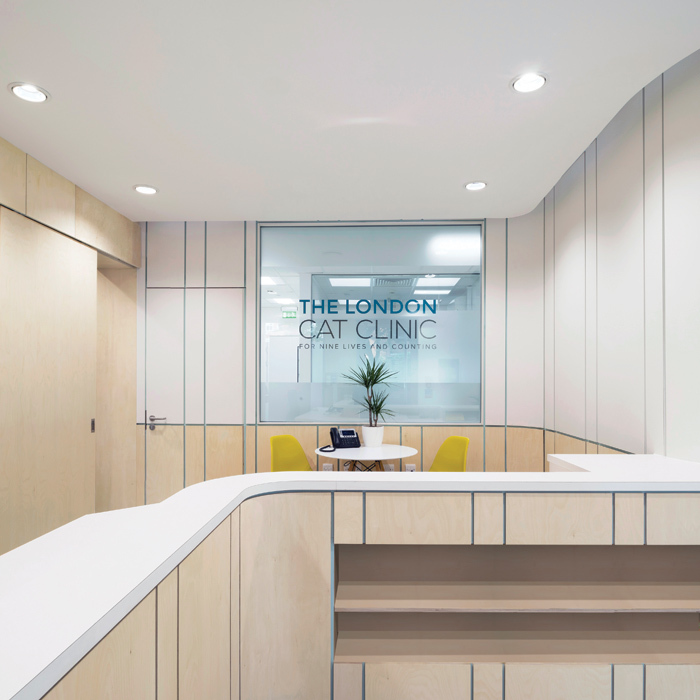 ‘The London Cat Clinic is the second specialist cat clinic that we have designed for an independent practitioner with very different values from the large chain and franchise vet practices,’ says Paul Wild, project architect at Gort Scott. ‘We worked rigorously alongside our client to carefully refine a sequence of spaces that would improve and streamline its day-to-day working practices. Glazed internal screens and translucent polycarbonate panels bring light deep into the floor plan and provide hints of activity from the practice’s public-facing areas. A bold use of colour also features throughout the scheme to reinforce the company’s identity. Visitors and feline patients are greeted by an innovative design of the reception area, which uses decorative timber and white laminate panels applied to blue-painted walls. Bespoke birch plywood joinery sub-divides the space. The scheme is driven by the veterinary practice’s core values, one being careful consideration of the welfare of its patients and their owners. Gort Scott has included bespoke elements such as the integrated ‘cubbies’ for cats to climb into, helping to ease anxiety and stress. But prior to the Cat Clinic’s existence the site was a shell-and-core commercial unit, in the Bermondsey spa area. Beginning in 2002, this area has been significantly redeveloped and regenerated as part of southwark’s Bermondsey spa masterplan. Gort Scott has reflected this area’s ‘excitement’ within the scheme by ensuring spaces are not limited to clinical environments. a ‘warm and homely’ welcome extends out to the street thanks to the frontage, which runs the entire length of the building. Internally, public-facing elements of the scheme draw parallels with retail design and even contemporary bespoke pharmacies.